UGC 7342 and the Hubble Voorwerpje roundup – can they get any weirder? They show a wild variety of forms, often with filaments of gas stretching thousands of light-years. These include loops, helical patterns, and less describable forms. fits with illumination by radiation escaping past a crudely torus-like structure. However, there is still less highly-ionized gas outside this whose energy source is not clear. As in IC 2497, the parent galaxy of Hanny’s Voorwerp, many of these galaxies show loops of ionized gas up to 300 light-years across emerging from the nuclei, a pattern which may suggest that whatever makes the nucleus fade so much in radiation accompanies an increase in the kinetic energy driving outflows from its vicinity. At the bottom of the poster we illustrate with new clarity a point we knew about in the original paper – for the two Voorwerpje systems with giant double radio sources, they completely break the usual pattern of alignment between the radio and emission-line axis. Mkn 1498 and NGC 5972 are aligned almost perpendicular, which can’t be fixed by changing our viewing angle. We’re speculating among ourselves as to how this could happen; maybe interaction of two massive black holes is twisting an accretion disk. But don’t quote me on that just yet. The color images here show only the ionized gas, with [O III] in green and Hα in red. Starlight from the galaxies has been subtracted based on filters which don’t show the gas, so we can isolate the gas properties. The false-color insets show the [O III]/Hα ratio. The blank regions are areas whose signal is too low for a useful measurement. Red indicates the highest ionization, fading to deep blue for the lowest. Click on this one to see it larger. We barely know where to begin. The actual AGN may lie behind a dust lane, and there is a large region of very low-ionization as near it. Another loop near the nucleus, and fantastically twisted filaments winding their way 75,000 light-years each way. There is still more to come – with Vardha Bennert and Drew Chojnowski, we planned the strategy for several upcoming observing runs at Lick Observatory (one starting only next week). 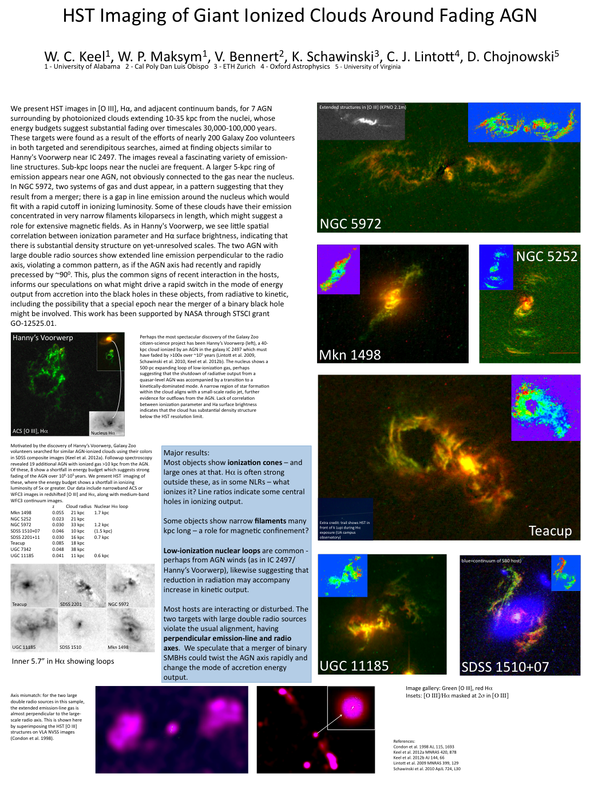 These should include getting data on some of the most promising AGN/companion systems to look for the AGN ionizing gas in companion galaxies, and observation of regions in the Voorwerpjes that we only now see a context for. Additional X-ray and radio observations could fill in some of the blanks in our understanding. And by all means, stay tuned!